The four words ‘Spider is Alfa Romeo’, an advertising slogan in use nearly 30 years ago, neatly sum up eighty years of Alfa Romeo spider convertible production (in both technical and emotional terms). 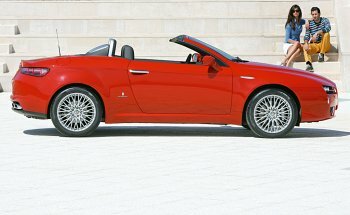 An automotive manufacturer such as Alfa Romeo whose name has always been a byword for motorsport, can only give free rein to its idea of freedom and passion by building a convertible. Like many historical icons that have passed into the common consciousness over the course of the decades, the Alfa Romeo convertible was created without a specific name to identify it. The period was the beginning of the twentieth century, spoked-wheeled cars created in Portello, such as the 40-60 HP, the 20-30 ES, up to the RL (Alfa Romeo’s first creations) were put through their paces against the chequered flag over circuits such as Targa Florio, Brescia, Modena and Parma. The management of the day were quick to realise that they could never come up with a better advertising slogan than that of offering customers a car that could boast such a wealth of sporting accolades. Through the intuitions and passion of designers and engineers such as Merosi and then Jani, Alfa Romeo became speed champions on the track and style icons on roads throughout the world, due to their impeccable engines and the artistry of bodybuilders such as Zagato and Touring, who channelled the power of the 1500 and 1750 engines into sleek, open-topped shapes. The English-speaking world looked on with great interest at these open-topped cars whose streamlined shapes allowed them to reach much higher speeds than saloons. The vehicles were therefore described as ‘speeders’ and the term became corrupted into ‘spiders’, even though they had nothing whatsoever to do with the eight-legged insects of the same name. Throughout the 1930s, the already cutting-edge engineering and styling of these cars underwent further refinement. The engines were upgraded to eight cylinders and their capacities were increased: the difficulties posed by circuits throughout Europe (from Le Mans to Monza) and the toughest adversaries did not deter the all-powerful 8C 2300 Spider Corsa or the 8C 2900 A and B. At the wheel of these racing cars, with his habit of hurtling headlong into the middle of bends and skidding out, was perhaps the greatest of them all: Tazio Nuvolari. The interlude of World War II brought a temporary halt to Italian automotive production. The first signs of recovery came at the beginning of the Fifties, but the clamour for coupés and convertibles did not really begin to make itself heard until the time of new prosperity in the Sixties. Alfa Romeo responded to this need with a car derived from a coupé version but with a shape that belied its great personality: thus 1955 saw the advent of the Giulietta Spider. Though Zagato and Touring had built the bodies of previous convertibles, for the Giulietta Spider, the powers that be at Alfa Romeo decided to commission two prototypes from Bertone (the Giulietta Sprint that was the forerunner of the coupé) and from Pininfarina. Graceful, regular proportions coupled with suave yet razor-sharp design assured the victory of the model produced by the factory set up by Giovan Battista Farina, who referred to his car affectionately as ‘la signorina’. The Giulietta Spider was initially launched only on the US market, where that well-proportioned design oozing artistic culture and the brandname redolent of so many racetrack triumphs symbolised a different way of life. The small cars (very often white) from Milan caused a sensation when they were first seen driving down the avenues of New York. 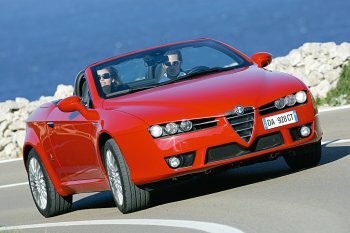 In Italy, convertibles (Alfa Romeo in particular) became a must-have phenomenon: these fast cars had the pick-up to burn up heavy saloons at the traffic lights and competition was beginning to arise between opposing ranks, as Giulietta drivers took on the British open-topped sports cars. Italian national spirit and pride, based on well-founded awareness of the product’s attributes, always won out and it was not by chance that the gorgeous Giulietta Spider entered the world of advertising with Domenico Modugno at the wheel. But the Giulietta was no ordinary style icon and amounted to much more than a status symbol: like any other Alfa Romeo, this car was put through its paces on the race track (in a 12 hour race at Sebring in 1960 for example) and in the world of competitive motorsport. The most original race and the one that aroused most press attention was won by a Giulietta Spider Veloce driven by Sanesi that came in 20 minutes ahead of the Settebello train (pride of the railway industry at that time) on the Milan-Rome line. The Touring body introduced between the end of the 1950s and the beginning of the 1960s was no less admired. This look, where elegance was more important than racing muscle, typified the 2000 and 2600 convertibles and proved itself perfectly attuned to the jetset lifestyle. It stood as a model of refinement and good taste, immortalised by memorable performances by actors such as Rossano Brazzi and Ugo Tognazzi, whose style blended perfectly with that of the Touring class. So far the Spiders we have examined were essentially open-topped versions of saloon or coupé models, but at the Geneva Motor Show of 1966, Alfa Romeo introduced a Spider so original, it was viewed in an entirely different light to any other model in production at that time. The Fiat top-management decided that they needed to get away from the Giulietta shape, which they considered outdated and commissioned Pininfarina (now inseparably linked with the Alfa Romeo name) to build a new car on the 1600 engine. 1966 saw the advent of the 1600 Spider, with a double convex shape that was drawn out harmoniously to give the car a cuttlebone form contained within a wraparound rounded shape with a quintessentially mannerist flavour. Such shapes were actually nothing new to Alfa Romeo convertibles: fourteen years earlier, the 1900 C 52 convertible known as the ‘Flying Saucer’ had aroused much curiosity and interest. After cars with evocative names such as the Giulietta and Giulia, this 1600 spider could hardly remain restricted by such a dry-sounding technical title. 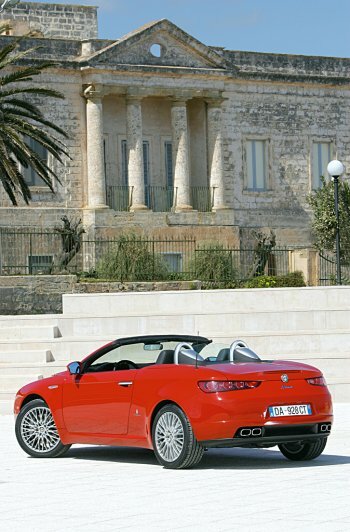 The Alfa Romeo top management, led by Giuseppe Luraghi, therefore announced a competition: anyone who came up with a name good enough to satisfy a special jury would be given a 1600 Spider. Many more people entered the competition than Alfa ever expected. So many, in fact, that once the jury had chosen the name ‘Duetto’, they had to pick a winner from all the entrants who had suggested this name. Mr Guidobaldo Trionfi was the lucky contestant: he based his entry on the number of passengers, the engine tone and the inseparable harmony of shape and feeling. The Duetto had only just entered the stage: then the young Dustin Hoffman arrived on Italian cinema screens aboard a red Duetto, driven in dashing style on the set of the film ‘The Graduate’, to the accompaniment of ‘Mrs. Robinson’ by Simon & Garfunkel. The film and the car were so popular that a special series of the Spider in the US was given the name of ‘Graduate’. The Seventies ushered in another look entirely and the car underwent a radical restyling. This mainly affected the rear end, with the disappearance of the cuttlebone shape in favour of a cut-off rear end. Different engines also came and went over the years, from the 1300 to the 2000 with the 1750 in between. And so production of Alfa Romeo spiders has continued in an unbroken strand up to the present day, a sign of the importance and awareness of Alfa Romeo's place in the world of convertibles, i.e. in the world of passion, motor racing, wind and asphalt. After all, Spider is Alfa Romeo.